There are claims that 50,000 shops now support this technology in the UK according to the Sunday Times InGear magazine. There are also selected IKEA stores and Yo! Sushi restaurants and many more independent businesses. 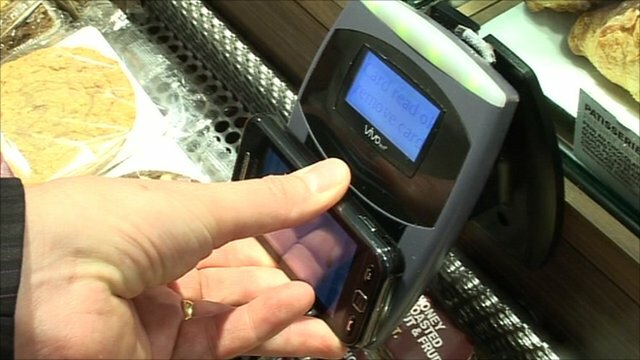 I mentioned NFC on a recent post and came across a new service launched in the UK with Orange and Barclaycard called “Quick Tap” and featured on BBC news. Does this mean mobile wallets are on the way? This service requries the NFC enabled Samsung Tocco Lite, clearly more handsets need to released and many more NFC readers installed in retailers / merchants. The first service that allows users to pay for purchases via their mobile phone has been launched in the UK. Among shops signed up to the system are McDonalds, EAT, Pret-a-Manger and some Boots stores. Users wishing to use the system – dubbed Quick Tap – will need Orange and Barclaycard accounts as well as a handset set up for contactless payments. The idea of the mobile wallet is gaining popularity around Europe. The service is made possible by Near Field Communication (NFC), the short-range wireless technology that underpins many wireless payment systems. Quick Tap is a collaboration between Orange and Barclaycard. It will require a NFC-enabled Samsung Tocco Lite handset, which also goes on sale on Friday. Only purchases up to a value of £15 can be made using the service but users can preload their mobile with up to £100. “Having a wallet on my phone has made it much more convenient to make purchases on the move and I like that it allows me to keep track of what I’m spending as I go,” said David Chan, chief executive of Barclaycard Consumer. “It is going to start a revolution in the way we pay for things on the high street,” added Pippa Dunn, vice president of Orange. Other stores signed up the service include Subway, Little Chef, Wilkinson and the National Trust. Later this summer, users will also be able to use the service to pay the toll on the M6 motorway. Giles Ubaghs, an analyst with Datamonitor, thinks take-up may be sluggish. “It is an important first step but I think there could be a lack of incentive. Early adopters may like it for the novelty value but the majority just won’t see the point,” he said. Mobile wallet services have been available in Japan for some years and operator DoCoMo NTT spent a good deal of cash getting them up and running. “They even had to buy a convenience store chain to get the readers in there but all the evidence is that people don’t use it that often. Only around 10% seem to use the NFC functionality on their phones,” said Mr Ubaghs. Mobile couponing, where people can swipe their handsets in order to get discounts on goods, could kickstart NFC technology, he thinks. Or it could find popularity in the future as an alternative to Bluetooth. “It may be used for swapping data from phone to phone or for, say, taking pictures from a phone and putting them on a TV,” he said. Nokia is believed to be bringing out an NFC-enabled version of the popular game Angry Birds later this year. In 2009 O2 trialled contactless payments, using mobiles in place of the popular Oyster card which allows commuters to pay for their tube journeys. It has said it will launch its mobile wallet service later this year. By the time of the Olympics it is expected that transactions, transport and tickets will all be available via contactless technology. Currently there are 50,000 stores with NFC-enabled readers in the UK. Some 12.9 million credit and debit cards are already in circulation.